A writer and his wife have their normally calm lives thrown into chaos by uninvited guests who turn out to be fans of his work. After watching "mother!" many viewers may walk out of the theater wondering what the hell they just watched. If you are at all familiar with the work of director Darren Aronofsky, including "Black Swan" and "The Fountain," you will know he is no stranger to using visual metaphors to tell his stories, which are anything but surface-level projects. His films are often ambiguous and his messages usually require a bit of thought on the part of the audience to decipher and unpack his true intent. Throughout each of his movies, Aronofsky will often leave a trail of breadcrumbs and a few hints and clues to guide people in the right direction. He isn't one to hold your hand or offer heavy exposition, as is the case with "mother!" The film stars Jennifer Lawrence and Javier Bardem as a married couple living in a very secluded, sprawling home. He is a poet and she mainly works on renovating their home, which was damaged by a fire in the past. One day an unexpected guest, played by Ed Harris, turns up on their doorstep. Apparently, he thought their house was a bed and breakfast, or so he claims. It turns out this stranger is actually a fan of Bardem's character's poetry. The poet enjoys the constant attention, adoration, and praise from this fan, but his wife isn't comfortable with having a stranger in their home, especially when he doesn't listen to their rules. Matters only get worse when this stranger's wife shows up unannounced, interjecting herself into the lives and problems of this couple, who are used to peace, quiet, and isolation. As more of the poet's fans show up day after day, things get more and more out of hand...and that's about as much of the plot we are willing to give away. "mother!" is an exceedingly hard film to nail down. It is difficult to review because, as we have often said on our site, we don't like to spoil movie plot points if we can help it. There is so much we want to say, but even the slightest detail would venture into spoiler territory, and trust us when we say this is a movie that begs the audience to go into it knowing nothing. We would love to give you our take on what Aronofsky was trying to say in this film, but that would imply we absolutely know which direction he was headed when we really don't. Aronofsky has so many things to say about life, culture, religion, politics, nature, fame, society, and humanity all wrapped up in this two-hour sensory and visual spectacle. We remained completely enthralled, paranoid, worried, scared, creeped out, unsettled, and in awe of Aronofsky's work from start to finish. Even if we were confused with what was going on, we remained on the edge of our seats waiting for the other shoe to drop. Director of photography Matthew Libatique has once again done an exquisite job, offering a striking visual display as he always does when he teams up with Aronofsky. The visuals combined with the stellar sound design, incredible practical effects, and expert performances make for an extremely well-made film. Jennifer Lawrence gives what may be the best performance of her young career. We have grown accustomed to her phoning her roles in over the last few years between her work on the "X-Men" series and "The Hunger Games" two-part finale. We have always enjoyed Lawrence as an actress and it is refreshing to see her so invested in this role. She gives an Oscar-worthy performance, though we aren't sure if the subject matter will click for all Oscar voters and may hurt her chances by proxy. Javier Bardem is fantastic as well, often showing perceived indifference to his wife's concerns about his fans. Michelle Pfeiffer is incredible and Ed Harris is equally impressive in their much smaller parts. We absolutely loved "mother!" This is a movie that won't connect with everyone because it does not have a straightforward narrative. It was rather mismarketed in its promotional materials. Aronofsky thrives in disturbing and unsettling his viewers regardless of who he offends. When we say disturbing, we truly mean it. There are some extremely hard to witness moments that will turn some viewers off immediately, and though the last act is exceedingly difficult to watch, Aronofsky has made it clear now and always that he is willing to go places most filmmakers are not willing to go and show things most movies would never dare attempt. The amount of admiration we have for this man is boundless as he continues to shake up Hollywood movie by movie. He is willing to take risks and be the one different voice in a crowd of carbon copy filmmakers. People constantly complain about the lack of originality in cinema, but when someone makes a unique, different, divisive piece of art like this, it is shunned, slammed, revolted, and given an F on CinemaScore. It's not because the populous is stupid (as other critics and movie lovers have stated), it's because people don't really want anything too drastically different, which makes us supremely distressed and saddened. It's the same reason why people eat at places like Denny's and Applebee's because they want something safe and consistent rather trying something new and interesting with the risk of not liking it. For us, the intrigue never lets up, and by movies end, hearts pounding, tears flowing, and eyes wide opened, we left the theater, discussed the film for hours, and have not stopped thinking about it since. Whether you love or you hate "mother!," chances are, this film will make lists and be on the tongues and minds of many in the years and decades to come. BRAVO, SIR. 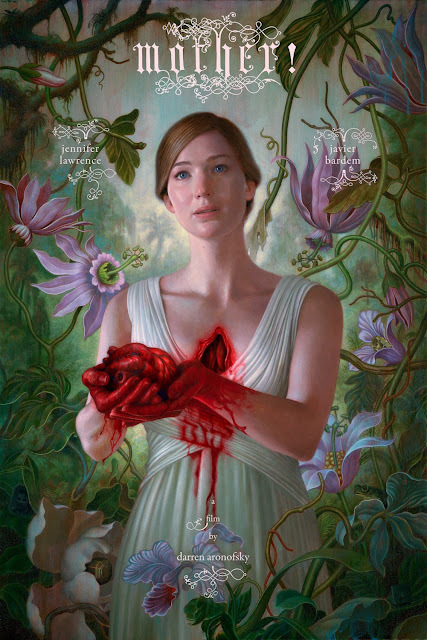 If you want to hear our spoiler talk and review of "mother!," take a listen to our podcast, which we record live every Wednesday at 6pm PT and every Saturday at 1pm PT! "mother" was in fact a good story if someone goes into the depth of story rather than giving a wild review and comment without thinking. I would give it the best rating possible.